What do Kate Moss, Phoebe Philo and Victoria Beckham have in common? They’re all stylish proof that you don’t have to relegate yourself to baggy, beige granny clothes once you hit the big 4-0. In fact, certainly in Victoria Beckham’s case, they’re evidence that if anything it’s possible to become more stylish with age (partly no doubt down to increased self-confidence, and better understanding and accepting who we are). But that said, there are a few fashion faux-pas that it’s best to avoid once you hit your forties. And as always, Karen Skagerlind is on hand to help. So what fashion mistakes should you steer clear of once you’ve said farewell to your thirties? 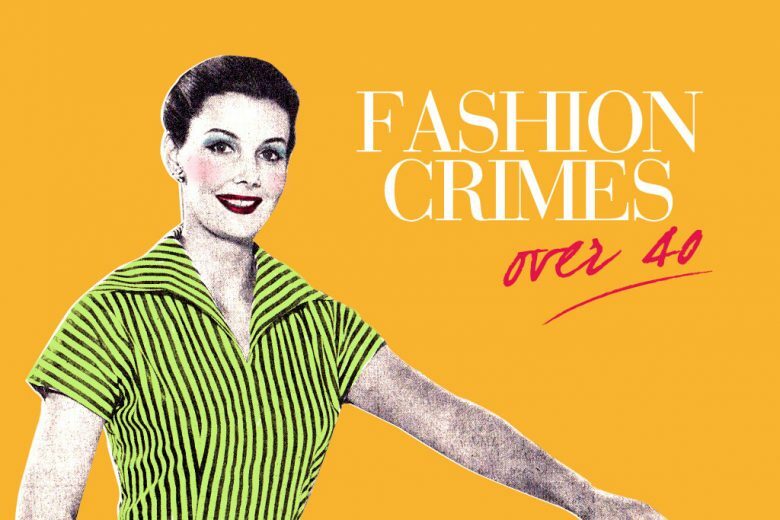 While Victoria Beckham may have carved out a successful career as a fashion designer, my advice is to follow fashion by all means – subscribe to style magazines or online style blogs, and be trend aware – but resist becoming a fashion slave. Unless you are on the frontline of the fashion industry, an Italian fashion stylist, editor at large of Vogue Japan or Anna Dello Russo, mixing a multitude of trends together will garner ridicule rather than envy. My mantra is that fashion isn’t always stylish, but style is always in fashion. So pick a current trend that fits in with your personal style to update your look, and recognise that some trends are just not you – regardless of age. Again Victoria Beckham has worked hard at creating an effortless personal style that works for her and has earned her the best dressed award on many occasions. But those of us who remember the Spice Girls and the outfits she wore when she first met David Beckham will know this wasn’t always the case. Recognising and embracing your innate style will mean that you buy the right clothes – items that will enhance your personality and reflect the ‘real you’, giving you confidence and the easy style that others envy. But what if you haven’t identified it yet? Ask yourself who your style icon is – a celebrity or media figure whose look you love, or perhaps a family member, friend or colleague. Then break down their outfits. Ask yourself whether they do casual layering well, effortlessly work tailored separates or successfully experiment with colour. Look at media images of them in both casual day looks and dressed up and really analyse the items that make up their core wardrobe. Once you understand what they do, adapt that to your own needs, shape and size. I create mood boards for clients from a detailed questionnaire to really help them identify their innate style. We’ve all got one and we should really know it by the time we hit this milestone birthday! While Victoria Beckham definitely has no upper limit on her clothing budget, I’m pretty sure she would probably have a lower one! Don’t get me wrong, I’m all for the high street retailers (my friends know that TK Maxx is a firm favourite of mine! ), but I draw the line when items are so cheap that you know they won’t last two weeks – let alone a season. As you reach a certain age, regardless of your disposable income you should buy less and spend more. Think quality basics, investment or statement pieces and heirlooms. It doesn’t necessarily mean that you need to splash out on designer or expensive items. By shopping wisely, waiting for the sales, and understanding the brands and what they specialise in, and what suits you, you’ll soon be well on your way to getting that covetable capsule wardrobe. Fast fashion retailers by virtue offer cheaper ranges that are aimed at the young and experimental – and at 40 that’s not you! Of course it’s not just once we hit our forties that we need to stay true to our personal style, and buy items that flatter us and confidently reflect our inner selves – it’s a wise fashion approach at any age. And rather than giving up on fashion as you get older, you can instead use the increased self-confidence and awareness (as well as wisdom) that often comes with each passing year to finally grow into your personal style, and embrace the real you with aplomb!